I just wanted to let you all know that I have found a printer! The details will hopefully be printed next week so - depending on the postal service - just maybe - we may have them within two weeks!!! It's always great to know if you're planning on sending me anything - in case the letter/package gets lost in the jungle of the postal service... Also - coins tend to ruin envelopes and get lost along the way so try to send bills but if this isn't possible tape the coins to a piece of paper or a card. Send money calculated/CD and an addressed (your address) envelope. Click the pictures for close-ups! Miss Takes - Light - The Night! printed slip WITH Lyrics in plastic pocket!!! Yes it's true. 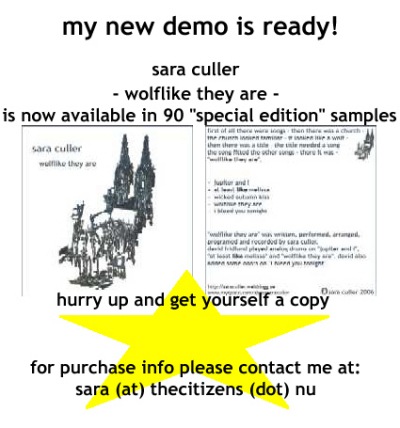 My new demo is finally here!!! The demo includes the song "at least like melissa" and I can promise you that the other songs have followed in the same footsteps. "jupiter and i" - a "orchestrated" song with a time ticking clock telling about struggles against something bigger than yourself. Click here to download or get over to my MySpace and stream it and other songs! Thanx to Magnus Bjerkert for lending me server space! "wicked autumn kiss" - the longing and wanting to be somewhere else - where autumn is ok - but autumn is also something darker and it hides amongst the trees - breathing down your collar. "wolflike they are" - a song for two parties. One is told to keep their wolves inside - The other is told to shut off and run - but is stuck in it all. "i bleed you tonight" is a love song from a warm heart in a cold place. It's freckin' irritating, frustrating and annoying. Problems are all over the place. All I really need to do is print the covers. First I thought that I could run them through an ordinary printer but NOOO… I will probably need to hire a professional printer or something so the colors look good. I had such bad feelings before 'cause my covers looked sooo boring and ordinary so this time I thought I'd do something special… But there is a price you have to pay and at this time I really don't have that much money. I'll get some soon but I don't have it now… And I'm going to manage to pull this through - just so you know it - And Don't Forget It! Today is a day where I feel like everything is hopeless and that the forces in the music world of Sweden are against me. That's when I turn to good memories - my safe places. "Sara and David have the experience of singing together - but here their voices are opposed. And it is so obviously Sara's own (sound) - not David as a solo artist or David & the Citizens - Welcome Sara"! You people out there familiar with the Swedish language visit the joker page here. It's a lonely job but hey, I got to do it - otherwise I'll be a no one to myself. I'm getting there. Three channels left. All of them supposedly filled with vocals. Gonna try a printer. Photo printer. Hopefully beautiful cover. Need sleep now. Play late gig tomorrow with David. Life continuing. Same sad sighs. More glow today though... Therefore three channels left. All of them supposedly filled with vocals - before Monday. You'll get demo soon. Me tired now. Goodnight. Sleep tight. Don't let the bedbugs bite. I can't say that I'm in the recording mood I'm supposed to be in. In these moments it's usually about keeping with it all. Today and yesterday weren't those days. I'm trying to get this demo ready. I feel the pressure and it needs to be done. I'm so close to the finish line but I think I'll have to take it one day at a time. I'm tired. Today I'll go and exchange some dollars (demo money) to be able to buy some of the stuff for the cover work. I really hope you'll like it. After a little computer break and chat with a friend of mine I decided to write a small little recording update. Got to get back to the porta studio - got to get back to the porta studio - say, "f**k you" to one of the songs 'cause it's not really cooperating with me right now... Start a new one - it's really a clean and quiet song compared to the others... so this'll be what my ears need right now. They are just sooo fed up with this one song. It's kind of fun - working on a lot of songs simultaneously. I usually tend to over work on one song - finish it and then move on - but this time it's different. I can easily drop one song when I get tired or my ears go all numb and gracefully move on to a new and fresh song. So right now I hate "Wicked Autumn Kiss" but I'll hopefully love working with "I Bleed You Tonight" for a while. All in all - three songs are totally done - One is one second from being finished - One is in the finishing. Around 8.40 PM this Sunday evening Lisa Wall (radio show host for Casino) played "My New Born Name" - Taken from my 2003 Five Song Demo. It was great to hear oneself on the air! Finally!!! Thank you Lisa! Every week Casino issues a theme called the Joker where they choose a band or a solo artist that deserves the attention and the ears of listeners. If you feel like it, you should click here and listen to the show. The radio show Casino, on Swedish public radio channel 4, will play me on their broadcast this coming Sunday! The show airs at 7.30 (Central European Time) and has a total of 3.5 hours of airtime. This will probably be the first time ever for any Swedish radio station to play me so tune in if you're in the country or click on the link here for Casino's homepage and listen after broadcasting. Too Late - New Show. To the left where it says Del 1, Del 2 Del 3 & Del 4 - This means - Part 1, Part 2, Part 3 & Part 4. This is where you listen. Listen to the whole show - They play great music - From unheard acts like me to more heard of acts like The Radio Dept. and David Fridlund and to even more heard of acts like Richard Thompson and Van Morrison! So. Tune in, turn off or drop out! Details on two songs are now in the finishing. Artwork is done but… What shape will it take? THAT, my friends, that is THE question!